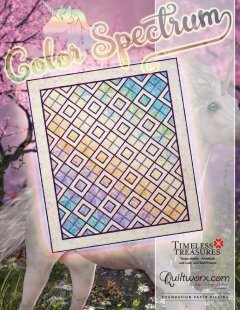 The Color Spectrum was designed as a beginner pattern to introduce quilters to paper piecing. The project is fast, uses only one foundation block, employs simple cutting techniques, and is an affordable and fun way to jump into your first paper piecing project. It is meant to make those new to the process find confidence, understanding, and success. The foundation papers for the Color Spectrum were designed by Quiltworx. The instructions included herein describe the process of making one quilt. Additional papers are available for purchase to increase the size of the pattern or make another quilt.